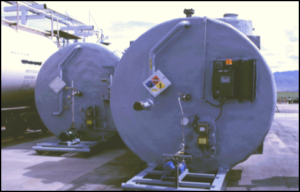 For storage considerations, Cyanco provides custom built storage tanks for Sodium Cyanide. 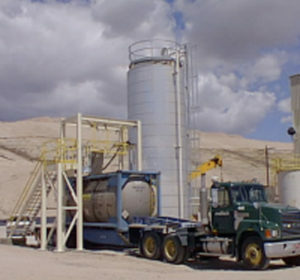 The tanks include the pumps and telemetry system to manage the distribution of sodium cyanide to the customer’s process. Cyanco uses voice-capable monitoring systems, where possible, to track and monitor customer tank levels. The telemetry system is part of Cyanco’s Vendor Managed Inventory (VMI) system to monitor product inventory at the customer’s site and automatically make deliveries to mine site when tank levels reach pre-set minimum levels. 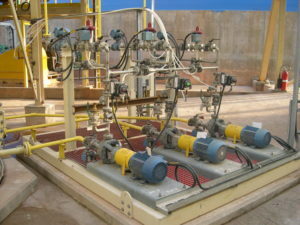 Our VMI system is used on virtually all liquid product customers and can easily be adapted for solid product customers. We want to ensure our customers always have adequate supply of sodium cyanide and we have never run a customer out of product. After all, no cyanide at the mine means no recoveries. Our goal is a “Worry-Free Delivery” Concept, where customers never even need to think about the cyanide delivery process, Cyanco manages it for them. Cyanco can provide skid mounted cyanide distribution systems that can accurately dose cyanide solution to multiple addition points throughout the customer’s circuit for both heap leach and mill applications.